Bonuses and company jets are the new scarlet letter of the economic recession and companies are heeding pressure from the public to shed their elitist image. Of the nine largest recipients of Troubled Assets Relief Program (TARP) money, four tell CBS News they are trying to downsize their corporate jet fleets. And there is good news for pending sales: private jet consultants say the market for corporate aircraft has recently shown new signs of life, despite rock bottom prices. Kevin O'Leary of the private aviation consulting firm Jet Advisors, says when he compares the first two months of 2009 to the first two months of 2008 he sees a 71% increase in inventory and sales are down by 56%. But he says that while jets were being sold at "fire sale" prices a few months ago, sometimes $10 million below market value, prices have recently gone up. He says he is seeing more corporate jets in the marketplace and he attributes it to pressure from the public and the Obama administration, "A private jet has a bad connotation right now." Despite a slight uptick in activity, corporations who unload their jets in this market will still not get the best price according to Craig Bowers of Jet Forward Aviation. But he says companies seem more worried about negative public relations than getting the most money for their planes. He says he recently got a call from a client who wanted to shed his jet, "He said to me 'as much as I love it, I'm concerned with how it looks with me landing at the [airport] and rolling up in a private jet.'" Bank of America currently has the largest fleet of the top TARP recipients, with eight jets registered in its hometown of Charlotte, North Carolina according to Federal Aviation Administration records. A bank spokesman says the company is looking to sell three fixed-wing aircraft and unload a helicopter the company obtained during its acquisition of Merrill Lynch. 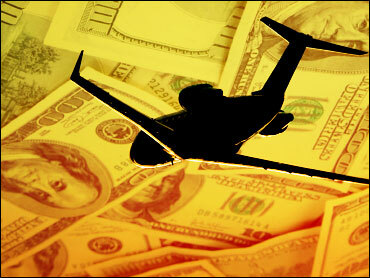 The bank spokesman says the company ultimately wants to pare down to five airplanes. Well Fargo tells CBS News they used to have one jet but when they acquired Wachovia Bank, they got seven more. Now they say they want to downsize to two or three. Citigroup is also looking to pare down its fleet of five jets in Westchester, New York to two. The company ran into fierce criticism in late January after it was reported by the New York Post that the firm was about to purchase a $50 million jet. After the outrage, Citibank abandoned its plans to buy the plane. Morgan Stanley and Bank of New York Mellon both tell CBS News they currently have two jets each. JP Morgan Chase says contrary to a report by ABC News, they are not buying any additional planes to the four they currently own. They say they also have no plans to upgrade their hangar in Westchester, New York but say they will move into a slightly larger space which will cost an additional $600 per month. AIG spokesman Mark Herr says his company currently has five jets. The company's fleet was much larger. In 2008 Herr says they sold two jets and two more in 2009. This year they also "declined to take delivery of another jet." Herr adds while the company wants offload more aircraft, it's not easy, "as you might imagine, the market for jets is not robust right now." Boston based State Street tells CBS News they own no corporate jets. And investment giant Goldman Sachs tell CBS News that not only do they not own any jets today, they never have.